They are the best of publishers, they are the worst of publishers. It all depends on who you talk to. If you can. Many know TOR books as a science fiction powerhouse. They publish best selling authors who love them to pieces, and well they should. Then they publish us. This might be a surprise to many of our readers, as we have been self–publishing Girl Genius and other comical books for over thirty years. 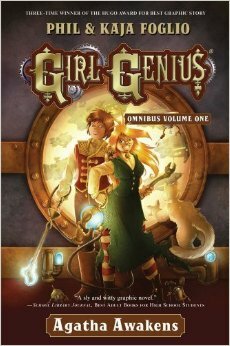 But, in fact, TOR is the publisher of the first Girl Genius Omnibus; Agatha Awakens. You see, TOR was thinking about starting up a line of science fiction graphic novels, and told us that they thought having a multiple Hugo Award winner as the launch title would be a nice touch.